Do you have wrinkles, serious creases and jowls on the face, and loose skin on your neck? Venus Freeze™ skin tightening has the incredible ability of tightening your complexion by improving blood flow and increasing collagen and elastin production. By remodeling the skin’s structure, you’ll notice a smoother and firmer complexion that is reminiscent of your younger days. Venus Freeze™ can also shrink your pores, making them less noticeable! You’ll have smoother, firmer skin after a series of sessions. (MP)2 is the technology that Venus Freeze™ is based on. This advanced technology boosts the circulation of blood flow to the treated area, allowing for the delivery of more nutrients and elimination of trapped toxins and waste. Skin cells are nourished at a better rate, improving overall complexion, tone, and texture. Tighten loose skin to banish sagginess and wrinkles on your face and body with Venus Freeze™ skin tightening treatment. The results are amazing — see for yourself! 1. Why is Venus Freeze™ better? 2. How does it tighten skin? Venus Freeze™ delivers patented energy to assist in the creation of new blood vessels and the proliferation of dermal fibroblasts. These help the skin become healthier by restructuring the way it is and allowing it to get the nutrients it needs through the circulatory system. Combined with the initialization of improved collagen and elastin, triggered by controlled thermal damage at the dermal level, the result is tighter and smoother skin that is less saggy and wrinkled. Notice the improvement in the lower face and neck area. The skin is tighter and firmer. Because we consider your comfort, you won’t feel pain. In fact, most patients find it quite relaxing! The area treated will feel warm but not hot. A slight pinkness to the skin may be seen. However, both the warmth and pinkness won’t last too long, and go away within an hour or two after your session. You’ll look like you’re glowing. 4. Am I a candidate? 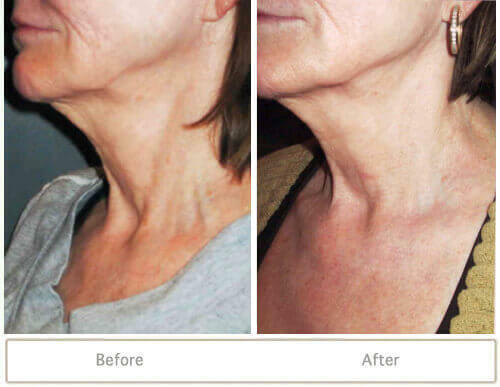 This skin tightening system is suitable for just about any skin type or tone. However, you’ll still require an assessment before you start your sessions just to make sure that the treatment is suitable for you and is capable of achieving your goals. There are some contraindications that exist, but your technician will let you know. Some contraindications include infection or inflammation at the treatment site as well as broken skin. These things will make the treatment riskier, so you should wait until they’ve resolved before proceeding. You should also have realistic expectations. 5. How should I prepare for my treatment? You don’t need to do anything before your treatment. Just arrive at our clinic and we’ll do the rest! Please note that if you have tanned recently, your appointment may be rescheduled for your safety. 6. What happens during my treatments? First, you’ll be asked to lay on a comfortable treatment bed. Your experienced medical technician will apply a gel to your cleansed skin in the area that will be treated. This gel allows the applicator of the device to glide smoothly across the surface of your skin, allowing for more even exposure and to improve your comfort. A specific applicator size is used, based on your concerns. Then, the applicator is glided gently and smoothly across your skin in consistent movements. The experience is very comfortable and feels like a warm massage that you’d get from your masseuse — except not as painful! This is a great time to just relax and allow the technology to do their magic. Once completed, the gel will be wiped away and you’ll be free to go home. It’s that easy! One session lasts about 30 minutes or so. You may see results after a single session, but up to 10 may be necessary for optimal results. Each session takes under an hour. 8. How long do my results last? The tightening effect on your skin will be affected by the natural aging process. You will enjoy a 25% increase in the thickness of your skin, however this will gradually reduce with time. If you’d like to maintain your results, maintenance sessions can be performed every four months or so. That way, you won’t lose the effects of your treatment.